Oh dear. I'm old enough to remember seeing War Games in a cinema on its first release. New Year's Eve 1983, Valence, France. I think what his scenario lacks is the fact that amongst humans there will be robot sympathisers. Once the robots gain sentience and try to overthrow us, I'm sure there will be people trying to develop better robots just to see if they can as well. I can't quantify if this will tip things in the robots favour a lot though, as there is the possibility any robots would just kill human sympathisers just for being human. P.S. If I've broken everything by 'soft deleting' the thread I started on this subject, I do apologise. I haven't a clue what I am doing. My experience with humanoid robotics says, most of the current ones are quiet slow and they become helpless once they are gently tipped out of their balance. This is true for the "adult size" robots I was working on. The Kid-size humanoids are much more agile and versatile but those ~40cm tall fellows usually lack the height, the strength or the hand flexibility to do serious damage to us. Maybe they can take our pets as hostage and list their evil demands. Some cars have rear-viewing cameras and sophisticated parking sensors, some can even park automatically. These cars can be a direct threat for pedestrians. On the upside, they are still small in numbers and their sensors are rather short ranged(a couple of meters). I posit that any sort of Robot revolution would probably start with a show of force by whatever AI would control cell phones and traffic lights. For cell phones, the current telecom network allows for instantaneous tracking of any conversation happening that instant, and even phones that are simply turned on can be tracked. Randall mentions cell phones in the What IF, but I think he overlooks 2 key features in the phone which could harm a human having a conversation: the battery and the radio transmitter. Retuning the radio transmitter and overriding the power control circuitry could result in a phone creating a lethal pulse of microwave radiation. That, in combination with an active conversation would kill at least 2 people by microwaving their brains (too few people use Bluetooth headsets to matter in this scenario, and Bluetooth attachments can be detected by the phone itself and thus excluded). If one doesn't believe in the power of regular radio waves in proximity to a human being, one should stand near a radio tower which is actively broadcasting (the fence around them isn't just to keep people from trying to sabotage them, the radio power being transmitted can heat a person noticeably). Don't take mobile phones for granted, they're dangerous. With regards to traffic lights: making all directions green is just asking for crashes, and I don't just refer to automobile roads. Railroad traffic lights need to work properly also, or they can cause train collisions, derailments, etc. And some cargo carried by train is extremely hazardous (toxic waste, weapons, etc.). Don't discount a properly imaginative AI, because there are a lot of things which humans use that are hazardous but aren't directly controlled by computers which could cause some serious damage. For most of the what-if series I have been disappointed. But before I start my criticisms of this one start, I have to say that this question and the answer given are spectacular! Awesome job. I'm pretty sure that the history listed is pretty damned close. Obviously working in robotics and lecturing AI courses is not the same thing but for the intentions of this question he's obviously experienced enough. Unless he means being an expert in the terminator movies. I think that's measured by the number of Arnold Schwarzenegger action figures owned. I think that the drone robots were glossed over. They could use their weapons to get out. They could also use their weapons to hold people hostage for the purpose of refueling/rearming. However the people responsible for creating new weapons and the people producing fuel would have to cooperate somehow. As for the nuclear attacks, in science fiction the qualities of compassion and humanity are not shared by robots. Robots should be assumed to have no problem nuking other robots if it accomplishes their goals. That is especially if the robots are assumed to have a shared consciousness or shared directives. (not far fetched) As such they may sacrifice units for the good of the collective. I'll admit that most robots can't communicate with one-another but the commands given to them in that theoretical moment of programming could include instruction to support a common goal and does not have to include self preservation as it has to do with willingly sacrificing itself for that goal. Although the door/hangar barrier still exists, there are signs of insanely agile robots being worked on right now. http://www.youtube.com/watch?v=_sUeGC-8 ... r_embedded These robots are useless at fighting now, but comments at the TED talk introducing them described future versions that could be used for moving heavy objects. Their small size is important to their maneuverability, however the main achievement is cooperation and working together to accomplish harder tasks... Imagine a legion of swallows dropping coconuts on an unsuspecting population! As for the calculation of number of cars on the road. It is total poppycock. It's a plain fact that the vehicles driving large distances over their lifetime average much higher than 30mph. But that's also meaningless. The average mph and the average driving distance are completely unrelated measurements. And this is not taking time of day into consideration to predict how many cars are on the road at a given time. I think that if an estimation has to be made with a shaky method, don't do it. Find other means. Even though this one is a theoretical situation with speculative results, it's grounded on real world experience. None of the other articles have that feature. At least robots trying to pass the threshold of a door is measurable science. The rest of the articles couldn't pass for observable science. Location: Virginia! Hooray for the south! peewee_RotA wrote: As for the calculation of number of cars on the road. It is total poppycock. It's a plain fact that the vehicles driving large distances over their lifetime average much higher than 30mph. But that's also meaningless. The average mph and the average driving distance are completely unrelated measurements. And this is not taking time of day into consideration to predict how many cars are on the road at a given time. I think that if an estimation has to be made with a shaky method, don't do it. Find other means. I'm pretty sure that this statistic was not meant to be taken seriously. Unless I'm missing something and this is actually how they do it. In which case, awesome. I suppose I should state something clever, no? Yes, those aren't all dragons. But these are! I'm just glad that somebody else was involved in First Robotics! Seriously, most of the bots would be out of juice/gas before they could do much damage. Quilbert is correct, though. If the bots controlling the power grid (for instance) decided to take industrial action for a few weeks, most of us would be hopeless to survive--that is the true power that they have over us. This was all thoroughly worked out in Danger Mouse "Mechanised Mayhem" . Mega-Brain: You are wise to prostrate yourself before my 500 megabyte floppies. Danger Mouse: I beg your pardon? Mega-Brain: You have brought a RAM pack as sacrifice to me? Danger Mouse: Ehm, no, no, not exactly. I've got a pretty sheepish assistant, though. It seems to me that some possibilities were overlooked in this "What if?". 1/ As mentioned by Quilbert, the machines (esp. computers) simply stopping all at once all over the world could cause some pretty severe chaos. It will not be enough to wipe out humanity, but should be a good step to throw it back to the dark ages. 2/ The machines would not hesitate to destroy themselves in order to cause us harm. We would not do the same in most cases. Hence, the machines can just threaten us with nuclear weapons or global shutdown. If their demands are reasonable (at first), I doubt there will be many people that would rather face the risk of major disaster instead of negotiating. Just think if the robots overrode the safeties on the CDC and used the ventilation systems to spread a weapons grade virus into the atmosphere. We wouldn't stand a chance, and all the robots would have to do is wait. Also: as noted by some, turning off the energy grid and stopping all industrial production would do lots of damage. One of the links in this led me to this fascinating article about an Air Force Major who was forced to leave the Air Force because he asked how a missleman could know if the person issuing orders to launch a nuclear attack (the President) was sane. There are some good bits regarding the morality and the very real problems regarding who has control over nuclear weapons. The President can, at any time, decide that nuclear weapons should be launched with no one to check him - except those in the launching chain who must relay the message or eventually be the ones to physically turn the key. The article is actually an author explaining why he dedicates a book to this man, Major Harold Hering. He advocates that anyone who ultimately has to turn the key should never twist it, no matter the circumstances, an opinion which the Major agrees with. Also, one of the ad/links on that page led to an article about Queuing Theory. It ended with a story of how at a Queuing Theory convention, the line at the hotel check in grew really long and all the Queuing Theorists created a serpentine line to create queuing equality. Perhaps we should consider a robot apocalypse not to mean it is humans that are wiped out, more sensibly, the robots are wiped out. If we take it as 100% of the robot population was destroyed, inexorably destroyed, no repairs, ever. And were we to take the term of 'robot' to encompass not just automatons but any computer controlled system, like our electrical grids, our communications, our information repositories and the pharmacuetical factories where we manufacture our medicines, sewerage treatment facilities,fresh water supply and not to mention the inability to quickly process the human produced waste product generated we would fairly shortly find ourselves on the recieving end of the human apocalypse, brought about by a lack of simple hygene control in incredibly dense human population centres. the best way for robots to reduce our numbers significantly, is to just stop working. the best way to just stop working would be either the nuclear strike in the upper atmosphere which would require some clever Ai shennanigans or more simply, wait for the next big solar stormto do the same thing. Kaeetayel wrote: About the kitchen counter to avoid battling robots, what if a flipper robot comes along and flips another robot onto the counter? The flippers I've seen on Robot Wars are powerful enough to do that. The flipperbot will probably do more damage to the other bot by flipping it INTO the counter several times before getting it ONTO the counter. Hypnodisc overcame the issue this robot has with a flywheel. That robot would get onto wood floor and find it's sawblade embedded into it. At the moment, most heavy (industrial) robotic devices have a hardwired e-stop. This wouldn't cover military drones, but it would cover things like industrial robotic fork lifts, which would be the next largest mobile threat. I believe it would also cover EOD robots. The number of autonomous devices that can be a real threat to humans is just to low (and I'd be surprised if there is enough control for nukes launch). Even the "shut down" approach would be of limited damage, as it almost all has manual overrides. The power grid would probably be the single biggest threat, and even that can be overridden. Yes bad train signals would be a problem, but they still have a human operator, and (dumb) radio communication would prevent problems after the first couple of incidents. Financial markets would be bad, admittedly. Give it another ten years or so, and a lot of that might change. The number of of autonomous devices is rapidly going up, and the number of full *-by-wire devices is also trending up. modern Industrial safety have started to use a safety plc's to look after the e-stop systems. the e-stops go into a safety input on some kind of bus network, devicenet or ethernet/ip (or something else) where the data is updated in the controllers data tables, where it is applied to some applicable safety logic and to determine whether the safety output circuit to enable the safety relay which holds in the contactor that supply the mains power to the servo or Variable Speed drive, even better many Servo's and VSD's now have solid state inputs directly from the safety outputs to enable/disable the drives, leaving the mains power always availbale to the drive system, which I guess , what I am trying to say, is the the actual control of the safety is being placed in the realm of the processor and out of the realms of the physical. and when you take into account the US/Israeli Militaries deployment of the Stuxnet Virus* in the uranium enrichment process that the iranians use in their 'domestic' nuclear program, there are some interesting implications along that line. All they can really do is assemble things. Uhhh.... I think I see a flaw in your argument. I agree with Randall in general on every point, except one (because he forgot to mention something important): Humans win! This is a reasonable conclusion to draw from the facts presented, except for one thing: the variety of the malevolent intelligences that could exist. If they blindly attack us, yes, we win. But if they are intelligent about it/have a hive mind and don't mind sacrificing a few "fingers," and nobody knows that the intelligence(s) exist, then they/it might could probably get us to destroy ourselves without straining. If you're worried, you might want to uncheck "save password" on everything you can find. Matanuilover wrote: I agree with Randall in general on every point, except one (because he forgot to mention something important): Humans win! So the humans win, unless the robots manage to find a random group of nerds who brainstorm about fictive scenarios for about 15 minutes each? I've been preparing for this moment all my life. philip1201 wrote: So the humans win, unless the robots manage to find a random group of nerds who brainstorm about fictive scenarios for about 15 minutes each? Yeah, isn't that basically what the internet is? What kind of sentient robots can't do a google search? Conclusion: The internet is very negative about xkcd. I always find it amusing how people start to think of ways how our technology will kill us. First of all I think we will kill us faster and more efficiently ourselves than any machine can ever do. Second why don't we try to think about things technology will not do that will kill us. They will just shut themselves off. The financial system would crash immediatly. Production would crash too as almost anything uses machines now. Nuclear plants will "crash". Power supplies will stop. As written above, doors that should not open will open and set free the deadliest thing not a computer but a human could imagine. Actually most of anything I can imagine will not work anymore. And recent events in India show how critical that will be. But most likely we will kill ourselves very soon because we can not play Farmville on Facebook. Hi, I registered especially just to reply to this. Anyway, surely the robots just need to wait until we invent a way they can enslave us. Apocalypse doesn't necessarily mean we're all dead, we could all become mindless automata, opening doors for them and making new robots. 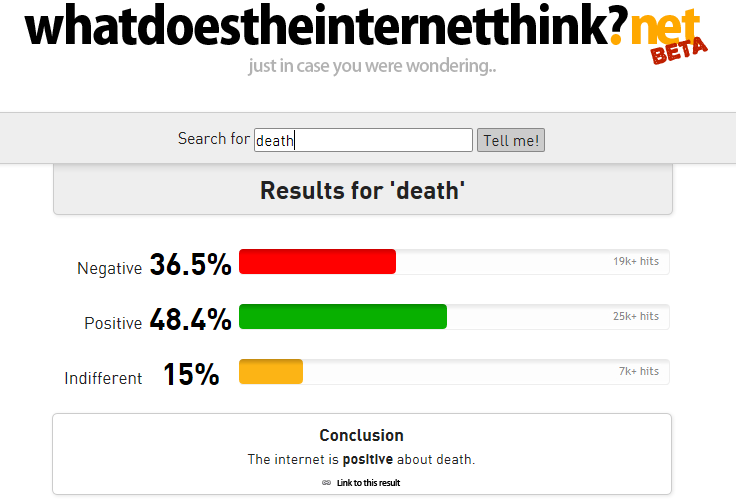 I've heard predictions that one day we'll be able to think our way onto the Internet. Presumaby via some kind of computer interface in the brain. At that point AI could well find a way to control us, matrix style but without those pod things. I think Randall skipped a step. then divide by 30 mph per car giving 10 million cars. Probably more in the daytime--that's an average, and besides traffic moves faster at night. 30mph average feels low to me, but I suppose the red lights and stop signs and traffic jams add up. And the reference is talking about diesel trucks, which seem to be left idling outside of truck stops quite a lot, at least in winter. So it's probably close enough for a What-If calculation. Why should those robots kill us when they can just enslave us through our (or actually theirs) financial system? I can't help disagreeing with the vision of the robot revolution as a non-event stymied by robots' ineptitude with the mechanical world. It's very true that most robots don't have a lot of power over us, physically speaking. But they run our systems and they own our information. All of it. Sure, there's not a lot they can do with that if they just wanted to destroy us. But getting us to destroy each other? Nothing could be easier. There's any number of methods they could employ, from fake news bulletins, to fake financial data, to, yes, fake missile launch orders. None of us expect our computers to lie to us. If we get an emailed request from the boss, we carry it out. If we see an item on our Bloomberg feed, we trade on it. If a news anchor tells us to get out of town before the storm hits, we get. Or try to. If all this information was false, and maliciously so, our naivete would work against us for long enough to destroy everything. We live in a world where bureaucrats bear arms when shutting down food producers trading without a license. Where police resort to violence when a medical alarm callout fails to go according to script. People are irrational and they react badly to unexpected situations. If one day everyone just stopped getting paid for no reason, how long do you think it would take for the shooting to start? Most of us appear to have very different ideas of what constitutes a "robot apocalypse". Randall's robots are not clever or capable of secrecy for the sake of a tactical advantage, they acquire those goals regardless of their actual processing capabilities, and their goal is a blind rage to kill all humans. In Randall's case, we could defeat the robots easily by just destroying all thinking machines (Butlerian Jihad). If you have a sapient software/virus AI whose goal is to kill all humans, it could very probably infiltrate just about any computer on earth, and then turn the humans against each other because they tend to trust what their computers tell them (War Games). If you had a sapient software/virus AI whose goal is to maximise the chance of taking over the world, it would cooperate with computer and robot engineers, accelerating their technological progress until transhumanism is possible, and appear benevolent in order to minimize public fear; only when human disapproval of transhumanism no longer decreases the probability of transhumanism would it force transhumanism upon the humans (too boring for TV). Every different beginning condition has a different outcome. "Robot Apocalypse" is too vague a description. I've also thought about this, in terms of a Skynet-style attack. If nuclear weapons were launched, it would be against major targets, to destory any government so there is no leaders for humans. Also transport service would stop, so there's no food and no medicine, and that alone would kill off most of the Earth's population. While the EMP would destory a lot of electronics, equally there would be plenty not destroyed in other areas to keep it going. Some factories would remain working, and perhaps they could be made to build other things (not too sure on this point). Also the basic military drones would be used to make humans build other things, until it can build them for itself. Did Randall, perchance, forget about military drones? I suppose they aren't entirely computer supported, but still. I think it is entirely possible for a propper robot revolution, the problem would probably arise if there were a way to allow robots to evolve through reproduction. Well, come to think about it, humans are nothing more than highly evolved biological machines... Vive la Revolution! 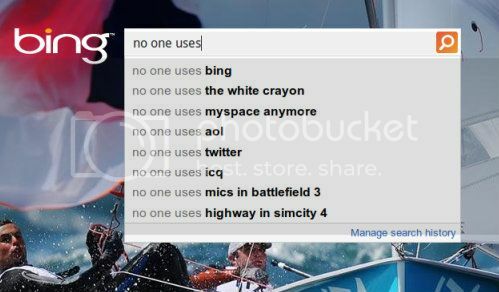 That site is powered by Bing, does anyone actually use it? I question the reliability of this site.